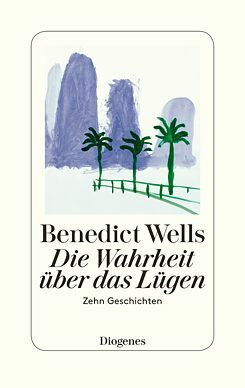 At age 23, when his first novel was published by Diogenes in 2008, Benedict Wells was the youngest author of the renowned publishing house. This novel has since been made into a film and his next three books were also successes. Now Wells presents a collection of short stories that can be considered virtually classic. © Diogenes Die Wahrheit über das Lügen (i.e. The truth about lies) is the title of the volume and contains ten stories from ten years. It tells the tale of a career-oriented husband and father of uncertain age who can no longer distinguish between the present and the past all that precisely. Another narrative consists of memories of the narrator's boarding-school years. The book also examines writers. In a decidedly parable-like story, a woman author with writer's block encounters her male muse, who, however, becomes increasingly human and in the end develops into an allegory. The title story Das Franchise oder: Die Wahrheit über das Lügen (i.e. The franchise, or the truth about lies) evokes the genre of fantastic literature. Adrian, an unsuccessful scriptwriter, is catapulted back to 1974 via time travel - and has four years to steal director George Lucas' idea for Star Wars. He succeeds and reaps global success and wealth. Lucas and his friend Francis Ford Coppola, whose film Apocalypse Now is a total flop, remain unsuccessful. The friendship between Lucas and Steven Spielberg also falls by the wayside, as Spielberg sides with Adrian in the dispute over the copyrights for Star Wars. For this reason, in Wells' narrative, the Indiana Jones films are never shot. With this story, Wells succeeds in creating an original as well as amusing "What-if" tale. In another story the death throes of a fly are the symbol of a failed marriage, in yet another a mileage status becomes the symbol of a father-son relationship. Then again, two men are locked up in a cell for unknown reasons and descend into an absurd table-tennis madness. Wells has chosen a quote by Japanese film director Akira Kurosawa as his motto: “Man is a genius when he is dreaming.” And Wells' stories are located at the exact interface between waking and dreaming, truth and illusion or lies. Some, such as The Night of the Books, even have a strongly fairytale quality. Wells knows how to bring images and figures to life with simple, yet very precise language. With his versatile narratives he succeeds in doing what only a handful of authors can do: Their narratives touch us, develop an undertow and bring us into this otherworldly condition, which only comes about when we plunge into a story and remain in it even after the end. Zürich, Switzerland: Diogenes, 2018. 256 p.
Holger Moos works in the „Libraries” department of the Goethe-Institut’s headquarters in Munich.